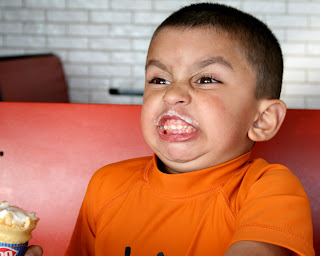 Have you ever experienced a freezing sensation after eating an ice cream cone? You’re with a group of friends eating the dessert, and suddenly you have a severe headache that lasts for a brief amount of time. You’re not alone because billions of individuals have endured this common reaction called sphenopalatine ganglioneuralgia. It’s also known as brain freeze or ice cream evoked headache. Why does even the simplest discomfort get a scientific name? But in all seriousness, what exactly happens to the body when one experiences a brain freeze? Prevention: Eat cold foods at a slower pace! There are two possible explanations behind pain and its association with a quick, big gulp of slushies, slurpees or Italian ice. 1) Blood vessel phenomenon: It is known that blood vessels constrict when the body experiences cold temperature and dilates when in hot temperature. This simple fact can be applied to the biological cause of brain freeze. Upon contact with ice, the blood vessels in the roof of the mouth begin to constrict, making the vessels in the head to expand, and thus creating a headache. 2) Trigeminal nerve factor: The trigeminal nerve is primarily responsible for the sensation of the face, also known as the fifth cranial nerve (CN-V). As a result of eating cold foods, the trigeminal nerve in the palate of the mouth becomes overstimulated. Stimulation of the nerve causes neurons to fire pain signals to the brain, producing a headache. Brain freeze is one of those common occurrences that bring the curiosity out of us. Curiosity stems from human nature. What other topics have made you ask, why and how?